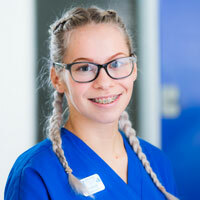 I started working at Atherton Veterinary Centre in September 2017 for my Veterinary Nursing degree placement year. In the future I would like to do additional qualifications in surgical nursing as this is the part of my job I find the most interesting. I have a dog called Domino and 2 rabbits called Spud and Coal.